The Very Large Array, a radio interferometer in New Mexico, USA. Radio astronomy is a subfield of astronomy that studies celestial objects at radio frequencies. The physical processes which produce radio waves are very different to those that produce light in other parts of the electromagnetic spectrum and the great advances in radio astronomy that took place after the Second World War yielded a number of important discoveries including Radio Galaxies, Pulsars, Masers and the Cosmic Microwave Background Radiation. The development of radio interferometry and aperture synthesis has allowed radio sources to be imaged with unprecedented angular resolution. The idea that celestial bodies may be emitting radio waves had been suspected some time before its discovery. In the 1860s, James Clerk Maxwell's equations had shown that electromagnetic radiation from stellar sources could exist with any wavelength, not just optical. Several notable scientists and experimenters such as Nikola Tesla, Oliver Lodge, and Max Planck predicted that the sun should be emitting radio waves. Lodge tried to observe solar signals but was unable to detect them due to technical limitations of his apparatus. The first identified astronomical radio source was one discovered serendipitously in the early 1930s when Karl Guthe Jansky, an engineer with Bell Telephone Laboratories, was investigating static that interfered with short wave transatlantic voice transmissions. Using a large directional antenna, Jansky noticed that his analog pen-and-paper recording system kept recording a repeating signal of unknown origin. Since the signal peaked once a day, Jansky originally suspected the source of the interference was the sun. Continued analysis showed that the source was not following the 24-hour cycle for the rising and setting of the sun but instead repeating on a cycle of 23 hours and 56 minutes, typical of an astronomical source "fixed" on the celestial sphere rotating in sync with sidereal time. By comparing his observations with optical astronomical maps, Jansky concluded that the radiation was coming from the Milky Way and was strongest in the direction of the center of the galaxy, in the constellation of Sagittarius . He announced his discovery in 1933. Jansky wanted to investigate the radio waves from the Milky Way in further detail but Bell Labs re-assigned Jansky to another project, so he did no further work in the field of astronomy. Grote Reber helped pioneer radio astronomy when he built a large parabolic "dish" radio telescope (9 m in diameter) in 1937. He was instrumental in repeating Karl Guthe Jansky's pioneering but somewhat simple work, and went on to conduct the first sky survey in the radio frequencies . On February 27, 1942, J.S. Hey, a British Army research officer, helped progress radio astronomy further, when he discovered that the sun emitted radio waves . By the early 1950s, Martin Ryle and Antony Hewish at Cambridge University had used the Cambridge Interferometer to map the radio sky, producing the famous 2C and 3C surveys of radio sources. Radio astronomers use different types of techniques to observe objects in the radio spectrum. Instruments may simply be pointed at an energetic radio source to analyze what type of emissions it makes. To “image” a region of the sky in more detail, multiple overlapping scans can be recorded and piece together in an image ("mosaicing"). The types of instruments being used depends on the weakness of the signal and the amount of detail needed. 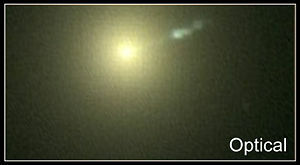 An optical image of the galaxy M87 (HST), a radio image of same galaxy using Interferometry (Very Large Array-VLA), and an image of the center section (VLBA) using a Very Long Baseline Array (Global VLBI) consisting of antennas in the United States, Germany, Italy, Finland, Sweden, and Spain. The jet of particles is suspected to be powered by a black hole in the center of the galaxy. Radio telescopes may need to be extremely large in order to receive signals with low signal-to-noise ratio. Also since angular resolution is a function of the diameter of the "objective" in proportion to the wavelength of the electromagnetic radiation being observed, radio telescopes have to be much larger in comparison to their optical counterparts. For example a 1-meter-diameter optical telescope is two million times bigger than the wavelength of light observed giving it a resolution of a few arc seconds, whereas a radio telescope "dish" many times that size may, depending on the wavelength observed, may only be able to resolve an object the size of the full moon (30 minutes of arc). The difficulty in achieving high resolutions with single radio telescopes led to radio interferometry, developed by British radio astronomer Martin Ryle and Australian-born engineer, radiophysicist, and radio astronomer Joseph Lade Pawsey in 1946. Radio interferometers consist of widely separated radio telescopes observing the same object that are connected together using coaxial cable, waveguide, optical fiber, or other type of transmission line. This not only increases the total signal collected, it can also be used in a process called Aperture synthesis to vastly increase resolution. This technique works by superposing (interfering) the signal waves from the different telescopes on the principle that waves that coincide with the same phase will add to each other while two waves that have opposite phases will cancel each other out. This creates a combined telescope that is the size of the antennas furthest apart in the array. In order to produce a high quality image, a large number of different separations between different telescopes are required (the projected separation between any two telescopes as seen from the radio source is called a baseline)—as many different baselines as possible are required in order to get a good quality image. For example the Very Large Array has 27 telescopes giving 351 independent baselines at once. Since the 1970s, telescopes from all over the world (and even in Earth orbit) have been combined to perform Very Long Baseline Interferometry. Data received at each antenna is paired with timing information, usually from a local atomic clock, and then stored for later analysis on magnetic tape or hard disk. At that later time, the data is correlated with data from other antennas similarly recorded, to produce the resulting image. Using this method it is possible to synthesize an antenna that is effectively the size of the Earth. The large distances between the telescopes enable very high angular resolutions to be achieved, much greater in fact than in any other field of astronomy. At the highest frequencies, synthesized beams less than 1 milliarcsecond are possible. The pre-eminent VLBI arrays operating today are the Very Long Baseline Array (with telescopes located across the North America) and the European VLBI Network (telescopes in Europe, China, South Africa and Puerto Rico). Each array usually operates separately, but occasional projects are observed together producing increased sensitivity. This is referred to as Global VLBI. There is also a VLBI network, the Long Baseline Array, operating in Australia. Since its inception, recording data onto hard media has been the only way to bring the data recorded at each telescope together for later correlation. However, the availability today of worldwide, high-bandwidth optical fiber networks makes it possible to do VLBI in real time. This technique (referred to as e-VLBI) has been pioneered by the EVN who now perform an increasing number of scientific e-VLBI projects per year. 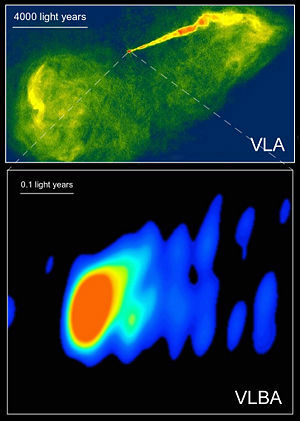 A radio image of the central region of the Milky Way galaxy. 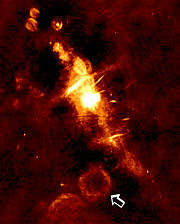 The arrow indicates a supernova remnant which is the location of a newly-discovered transient, bursting low-frequency radio source GCRT J1745-3009. Radio astronomy has led to substantial increases in astronomical knowledge, particularly with the discovery of several classes of new objects, including pulsars, quasars, and radio galaxies. This is because radio astronomy allows us to see things that are not detectable in optical astronomy. Such objects represent some of the most extreme and energetic physical processes in the universe. Radio astronomy is also partly responsible for the idea that dark matter is an important component of our universe; radio measurements of the rotation of galaxies suggest that there is much more mass in galaxies than has been directly observed. The cosmic microwave background radiation was also first detected using radio telescopes. However, radio telescopes have also been used to investigate objects much closer to home, including observations of the Sun and solar activity, and radar mapping of the planets. ↑ Pre-History of Radio Astronomy. NRAO. Retrieved August 25, 2008. ↑ Karl G. Jansky, 1933, "Radio waves from outside the solar system." Nature 132:66. ↑ Grote Reber. NRAO. Retrieved August 25, 2008. ↑ J. S. Hey, 1975, The Radio Universe, 2nd ed. Oxford, New York: Pergamon Press. ISBN 0080187617. ↑ A technological breakthrough for radio astronomy - Astronomical observations via high-speed data link. Innovations Report. Retrieved August 25, 2008. Rohlfs, K., and T. L. Wilson. 2004. Tools of Radio Astronomy. 4th ed. Astronomy and Astrophysics Library. Berlin: Springer. ISBN 3540403876. Sullivan, Woodruff Turner. 1982. Classics in Radio Astronomy. Studies in the History of Modern Science, 10. Dordrecht: Reidel. ISBN 9027713561. Radio Astronomy Reveals the Hidden Universe. 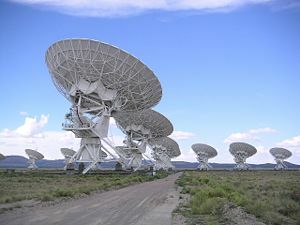 National Radio Astronomy Observatory (NRAO). How Radio Telescopes Work. NRAO. This page was last modified on 23 June 2015, at 15:52.